When I was a kid, late summer used to bring the monarch butterflies in droves. They would start massing in August in the southern Ontario countryside, sometimes in such numbers that they outnumbered the leaves on the trees. Watching the shimmering fire of their presence, it was as though autumn had come a month early. Throughout the summer we would often find their zebra-striped caterpillars, or the dangling green fruit of their pupae, on roadside milkweed pods. What North American school child did not study – and marvel at - the ‘life cycle of the butterfly’ using monarchs for illustrations? Monarchs have been renowned not just for their plenitude, but for the mass migration they make between Canada and southern Mexico, some even flying across the Gulf of Mexico, legend has it. It’s a feat as unusual for the insect world as it is miraculous. So I was glad, on a recent visit to the winding, country road of my childhood, to find this lone monarch fluttering past. Like a shard of my own memories, it flickered in the summer sun and alighted on some clover nearby, long enough for me to photograph it. And while the regal flicker of this butterfly still remains, so linger our hopes for a better future. There is something redeeming about that. 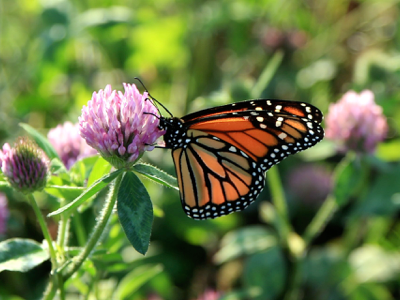 A Monarch butterfly (Danaus plexippus) feeding upon some August clover.